The ‘Chesh’ was formed in 1913 when a group of local cyclists, meeting at the Roebuck in Mobberley, Cheshire, decided to form a Sunday cycling club. A typical 1913 lunch at the Roebuck was :- Soup, choice of poultry, joint or steak and kidney pie, three vegetables and the usual sauces and etceteras. Sweets including lashings of cream. Cheese and biscuits plus tea or coffee – all for one shilling and sixpence! Founder members. C. H. Turnor and Teddy Sproston held several N.R.R.A. records. C. H. Turnor had the N.R.R.A. 24 hours Bicycle, 24 hours Tricycle and a share in the 24 hours Tandem Tricycle Records to his credit. Teddy Sproston was the first man to put the N.R.R.A. 12 hours Bicycle Record over the 200 mile mark. 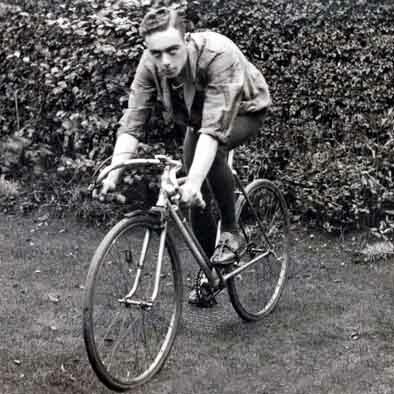 Fred Turner finished eighth in Cycling Weekly’s innaugural BAR competition in 1930. (He followed this up with ninth place in 1931). The club has survived the two World Wars and has had its fair share of record holders and a National 12 Hr Champion. In the early 1970s the club accepted female members for the first time. In 1998 the ‘Chesh’ organised the National ’50’ – the first to have a tie for first place! Now, in the new Millenium, we still have a fair number of members competing in time trials and on the track – although nowadays a handicap medal or a vet or junior prize is all most of us can hope for. A much more detailed account of the early years of the club (up to and including 1931) was written by Stan Wild and Tommy Nolan. Use the dropdowns on the History menu option to view. It would be nice to continue the story into the more recent past. LEJOG – John & Heather West. The Hill Climb Championships were held on Sunday 7th October on Long Hill. Fastest Chesh rider was Rob Bailey.